On the 3rd day in Kyushu region, I headed south from Fukuoka to Kumamoto. 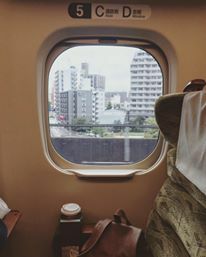 On the Shinkansen, it takes only 30 minutes to get there. I haven’t really taken the Shinkansen long distance before, but it feels just like the Taiwan High Speed rail! It’s comfortable, safe, and very convenient. Literally translated, Kuma means bear, and moto means origin. While there aren’t actually many bears in Kumamoto, the city has a bear mascot called “Kumamon”. He is also the station master at Kumamoto Station and has his own little desk! 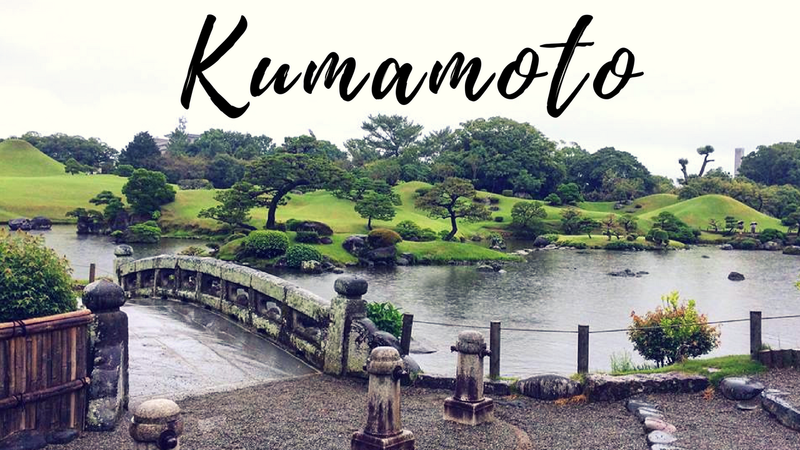 Because I only have a short morning, and then I needed to head back to the airport in Fukuoka, I had just 2 places to check out in Kumamoto. 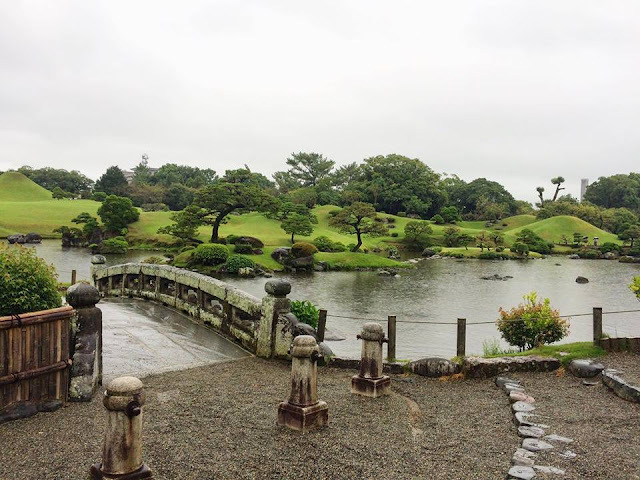 One was Suizenji Garden and the other is the Kumamoto Castle. After I got to Kumamoto Station, I got off the Shinkansen and continued onto the JR railway to Suizenji Station. It was gloomy and there were barely any people! I suppose it is only around 9am or so in the morning. I made my way to Suizenji Garden. As I bought my ticket and got in, it soon started pouring rain! But the Garden is really nice in the rain. If it were a sunny day you probably cannot see anything, a cloudy day is perfect for pictures. There’s a large lake in the middle and in the backdrop a series of small grassy hills. Some Japanese needle pine trees surround the lake’s shore. There were also koi fish in the lake in bright orange red and white colors. As you cross the stone bridge, on the left is Izumi Shrine. The temple itself was under construction so I just looked around for a little bit. Continuing on the path is a Fushimi Inai shrine with many red Toori gates and two foxes on either side. My small plastic bag (from 7-11) holding some small things broke, so I quickly finished off looking around the park. 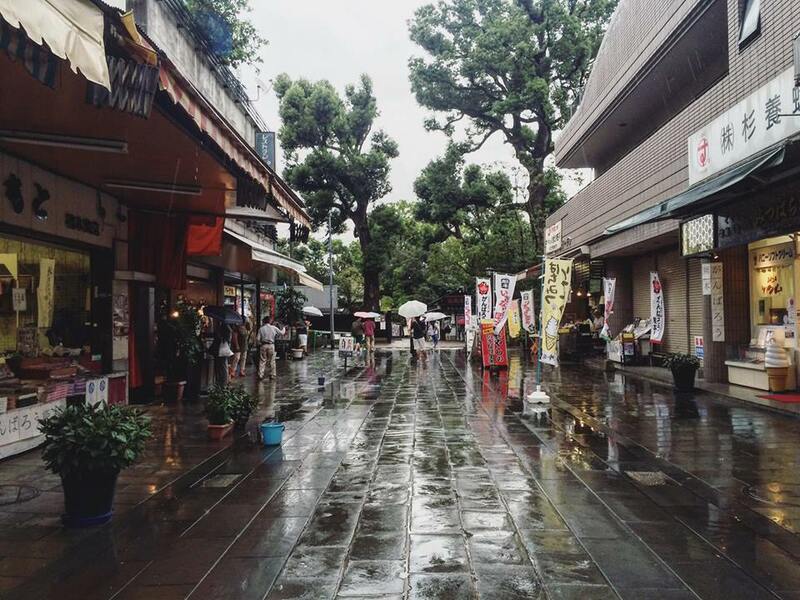 Outside the entrance of the Garden was a small and old traditional shopping street. I found a waterproof tote bag to replace my broken plastic bag and also a little coin pouch with Kumamo on it as a souvenir. 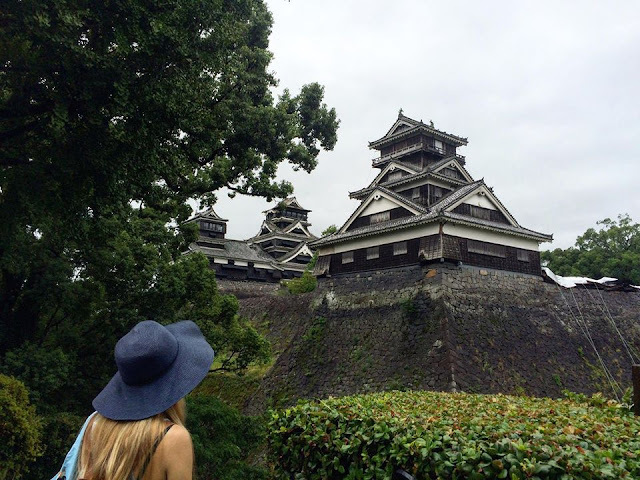 Afterwards I took the tram over to Kumamoto Castle. It is still damaged from the recent earthquake so the grounds are closed. At the foot of the entrance is a Kumamoto Castle Fushimi Inari Shrine! They sold a really pretty lucky charm shaped like a 4 leaf flower so I spent most of my leftover cash on it. I walked along the right side of the walls counter clock wise uphill until I reached Kato Shrine. The shrine is still opened and undamaged and there you can see a perfect view of Kumamoto castle. The roof collapsed and is damaged, and there are some other outer wall areas that have collapsed in a mud slide. But most of it is intact. Since I was travelling alone, I had to ask some Japanese girls to help take a photo for me. The photos usually come out great if you ask a girl to take a photo for you! The rain somewhat stopped, but I had to tread through a super muddy grass grounds until I can get to the other side of the entrance via a parking lot. My feet and sandals were covered in mud, and I used the rest of my water to rinse it off. I walked 30-40min in the rain, not pouring but enough to get most of my legs wet. So there I was, poor me, dragging myself through mud and rain, cashless, no more drinking water left… I attempted to withdraw some more cash at 7-11 but they only allowed me to withdraw 10,000 yen at a minimum. That’s almost $100 USD! Who withdraws that much… I’m pretty much heading to the airport straight after this and don’t intend on shopping. Thank god at Kumamoto main station, outside in a little room full of ATMs, I found the green ATM cash machine. I’m not sure which bank it is, but I’ve encountered this on in the Tokyo subway before as well. Instead of giving you the cash from a wall, it’s a flat panel like a table and the cash comes from underneath the machine. With that ATM machine you can withdraw whatever amount you like, so I got 3,000 yen! Finally I can get some water, and some lunch. I also tried Natto (Fermented soybean) for the first time. It is stinky as hell, tastes like weird soy sauce, but worse. I can now at least say I’ve tried it, but I wouldn’t eat it again. Back in Fukuoka the rain was pouring even harder. Like someone dumping buckets of water through the sky nonstop. But my luggage was back at the hotel so I had to take a bus back, pick up my luggage, then take the bus back to Hakata station again to get to the airport. I still had a lot of time so I shopped around Hakata station to dry myself off. I didn’t buy much, just some small accessories. Then I took the train back to the airport. It’s another really good weekend trip! In just 3 days (more like 2x half days and 1x full day) I was able to see a lot in 3 cities. There’s always so much to do and see in Japan and it’s perfect for short weekend trips. I’m sure I’ll be back very soon again!